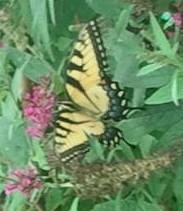 Giant Swallowtail grateful for the butterfly bush in my yard! It’s been awhile since I wrote a blog. I just haven’t had any ideas and have lacked motivation. Odd, that, since folks seem to like what I write. But finally today, my muse is working again. Thank God. Of course life isn’t fair. It seems as if it takes forever for us to learn that simple lesson. Life is not a court of law where God metes out a sentence for us to serve. Life is, well, just life. We can take it as it comes and try to make the best of it, or we can complain our way into old age and then look back wondering what happened. But gratitude is such an incredible feeling if we will wrap our arms around it, embrace it as if it is our soul mate, and look up to Heaven believing that we are blessed. When I feel blue, I make a gratitude list. I start out with three things per day and keep it up for as long as two weeks. The things I’m grateful for can be typical, ordinary things that I often take for granted: arms, legs, fingers, toes (even if they do need a pedicure! ), eyes to see, ears to hear, and a voice to speak (some may think I speak the wrong thing at the wrong time, but that’s on them!). I move to other things like having a roof over my head, a bed in which to sleep, and food in my fridge. Once I get going on my list, it’s really hard to stop and to limit it to three things a day. I take my list, look at it each morning and concentrate on being grateful. And, of course, the people in my life: family, friends, strangers I haven’t met yet! It’s amazing how fast my feelings of self-pity disappear when I stay in an attitude of gratitude. God has blessed me beyond belief. When I remember that, I’m much more likely to have a smile on my face. What are you grateful for today? I’d love to read the beginning of your list.